Today we are having a chat with Monica Biancardi, a well-established artist and photographer born in Naples, whose career started very early thanks to the collaboration with some Italian and foreign directors. In the meantime, she also carries out her own personal artistic research and teaching work in secondary schools first, then at university. Many of her artworks have been purchased by large private collections and prestigious institutions such as the Bibliothèque Nationale de France. Her work oscillates between a spiritual quest with a fine aesthetic taste and the photographic reportage whose result sometimes appear as an impeccable painting composition. What does your research revolve around? My research essentially deals with the subject of memory, tackling different themes and projects. 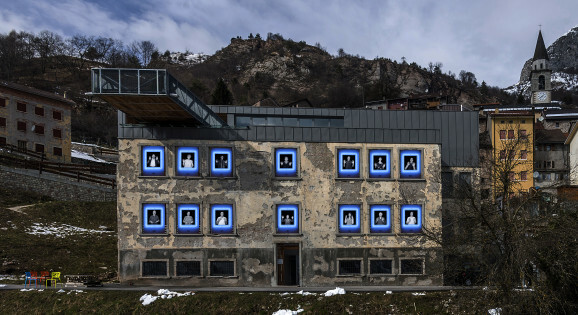 In your experience we can also find artistic performances and interventions with a strong emotional charge such as “Wall”, an artwork created for Dolomiti Contemporanee on the Vajont disaster. How do you combine your artistic sensitivity with the traumatic experiences of the protagonists of this project? The work I did for Dolomiti Contemporanee is a kind of anthropological work, where I had the chance to meet all the last inhabitants of the small villages of Casso and Erto. After the tragedy, the social system was destroyed by a large exodus and the schools in both villages were closed down. There were only a few people left. Amongst those few, I investigated for a long time through a series of interviews and then decided which portraits to make. These black and white portraits, showing hands, have been displayed in a Plexiglas sandwich with a blue neon light around them; underneath it, a label shows the person’s name and profession. This leads to a “sanctification” while they are alive rather than dead by those who decided to live in those places and those that never wanted to leave it. There is therefore a selection of half-length portraits that become like protective icons. It was a powerful, sometimes moving experience. I returned several times, also because of the prize I won, and always feel a certain pull. I was fascinated by the Habitus series, where you seem to want to ingrain your personal memory through an almost fetishist relationship with an object. Do you want to tell us about it? I teach drawing and history of costumes in secondary school and I have always dreamt of doing a project linked to costumes and the importance I give them. Therefore, amongst the clothing items that marked my history until now, I chose some that I wore for the first time to make a video, then I vacuum-packed them – once and for all. A slide projection completes the project, showing some biographical moments in which those items were worn. Which work are you most attached to and why? There is no artwork to which I am especially attached. Mutamenti (‘Changes’), dedicated to the premature death of my father, encloses my philosophy of change. Now I am doing a project on points of view because I think that life is this: a matter of light and points of view. For years now, I have been doing some work about the Palestine wall. I have been photographing two little Bedouin twin sisters in a West Bank village, since they were just 1 year old. Their family cannot move because of the wall so whenever I suddenly arrive at their place, they are there! Soon I will be making an exhibition about this, comparing Sarah and Sari’s portraits (the twins) with UN geographical maps (the only ones monitoring the territory), from their first year to when they start wearing a veil symbolising the imminent arrival of puberty. There is an important publication, amongst your next projects. Would you like to give us a small preview? 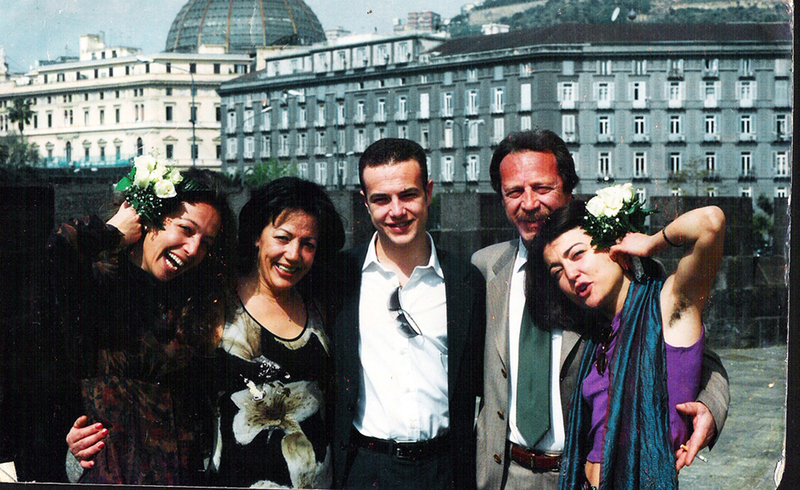 The book is called RiMembra (“ReMember”), published by Damiani in Bologna; it will be released in a few months and will feature wonderful ad hoc poems by the great Gabriele Frasca. The graphics are by the very talented Leonardo Sonnoli. The text was written by Lorand Hegy, the current director of the Saint’Etienne Museum. This project, made of diptychs and triptychs, includes an artwork bought by the Genzini collection. As you know, we are a digital archiving platform. How do you normally catalogue your work? Do you consider it an important practice in order to preserve and enhancing cultural heritage? I believe that cataloguing is an essential practice, precisely in order to preserve historical memories and allowing young generations to carry out their studies and research. I am glad for the work you are doing in a country like ours, which – alas – is so rich but unequipped in this sense and doesn’t seem to find the right means for proper archiving.